While there are certainly plenty of ultra-premium laptops out on the market right now, they are not all worth investing in. It’s not easy to find a budget laptop that offers the mainstream user things like Optane memory and fast storage, but that’s precisely what the Acer Swift 3 SF314-54-524Y offers. This is a nicely designed machine that offers some impressive hardware at a reasonable price. With it, users can also expect a decent battery life, variety of ports, and excellent keyboard and trackpad. Made by the Taiwanese manufacturer, Acer, these ultrabooks are known for their durable constructions and affordable pricing. This particular model is available in different colors, including black, gold, silver, red, etc. Its 14-inch FHD display features an IPS panel and 1920 x 1080 resolution. There are ports to keep both laptop futurists AND legacy users happy: these include two USB 3.0 ports and a 3.1 Type-C port. A front webcam (1280 x 720), microphone, and fingerprint reader are the built-in devices. Acer has set this Swift model up with a healthy configuration. Not only is it available in different colors, it features brushed aluminum, which has the benefit of not attracting smudges, dust, or fingerprints. Users won’t have to clean it very often. While the metal frame does add a bit of weight to the Acer Swift 3 SF314-54-524Y, it still only weighs 3.20 lbs. There are four fairly sized vents located at the base in order to allow airflow into the system. Rubber pads give it some stability and lift when it’s sitting on a flat surface. The trackpad is very roomy, even when compared to that of a MacBook. This paired with a nice keyboard and display with a decent resolution, and users get a Windows 10 notebook that easy and comfortable to use. As mentioned above, the Swift 3 comes with 16GB of Intel Optane Memory in addition to the 1TB HDD and Intel Core i5 quad-core processor (1.60-GHz) which is capable of 3.4-GHz with turbo technology. The standard memory is 8GB with DDR4 SDRAM technology. There is 1 memory slot and a memory card reader with support for SD memory. The graphics are the best integrated graphics one can expect: Intel UHD (620). Network and communication includes standard Wireless LAN (IEE 802.11 ac), Gigabit Ethernet, and Bluetooth 4.0 technology. 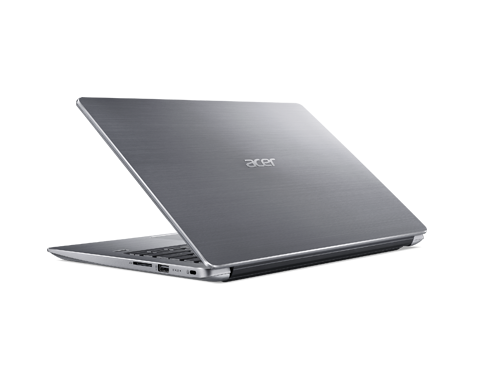 In summary, the Acer Swift 3 SF314-54-524Y is a wonderful budget ultrabook that provides users with a high storage capacity, fast wireless technology, long battery life, and a sleek, durable construction that guarantees the notebook a long lifetime. Keep in mind that this is an excellent machine for budget-conscious Acer discount shoppers. It has everything you need in a mainstream notebook. You can order it and save even more money in the process with Acer Swift 3 SF314-54-524Y promotional codes. This is an extremely thin convertible-hybrid laptop that measures just 0.43-inches in thickness and weighs 2.6-lbs. Despite its small size, it still comes with good hardware components and a large touchpad. Since it is wide, the touchpad is easy to use for multi-touch swiping and commands. The key feel is also excellent, making the Acer Spin 7 SP714-51-M024 a good machine to do a lot of typing on, whether it’s for school, work, or personal enjoyment. The 360-degree convert hinge maintains a durable, slim look while providing four different modes for users to enjoy. Regardless of which mode you use, the full HD 14-inch display shows crystal clarity and breathtaking images. The laptop mode is best for typing, tent and display modes are ideal for viewing videos and presentations, and tablet mode is obviously ideal for touch. The video and images aren’t the only things that are great about the Spin 7. Dolby Audio branded speakers can easily fill an average size room with quality sound effects and movie dialogue, with little to no distortion. There is never any fan noise, as the 2-in-1 comes with a fanless processor. Even without the fan, however, the Acer Spin 7 SP714-51-M024 can still stay cool. An Intel Core i7 (7Y75) processor is equipped, with a speed of 1.30-GHz. 8GB (LPDDR3) memory and a 256GB (Serial ATA / 300) storage drive are on par with this category of notebook. It comes with enough power, performance, and speed for day-to-day multi-tasking and computing. There is a memory card reader for those who use SD cards for additional storage. The 14-inch LCD display has LED backlight technology, CineCrystal screen technology, and IPS technology. The resolution on this multi touchscreen is 1920 x 1080. The graphics controller manufacturer is Intel and the graphics memory is shared. The OS that comes installed on the Acer Spin 7 SP714-51-M024 is Windows 10 Home (64-bit). The four-cell Lithium Polymer battery (2770 mAh) has a good runtime of around 9 – 9.5 hours, which is plenty enough to last for a full work or school day. The power supply has a maximum wattage of 45-W. Ports include two USB 3.1 Type-C ports, audio line out, and headphone / microphone jack. Stay connected to the internet wirelessly with Wireless LAN IEEE 802.11 ac standard. There is Bluetooth 4.1 technology and Gigabit Ethernet technology as well. All in all, the Acer Spin 7 SP714-51-M024 is a great choice for anyone who wants a thin, quiet convertible / hybrid notebook / tablet that comes with everything they need for business, school, entertainment, or simple web browsing. Its decent battery life and quiet operation also make it worth the investment. If you think you might want this convertible 2-in-1 notebook after reading Acer Spin 7 SP714-51-M024 reviews, get it today at a low price. Just visit the online store and get some Acer discounts or coupon codes to help you save. Acer Spin 1 SP111-31-C0RZ Review – What Does This Versatile 2-in-1 Notebook Offer? What Can Users Expect? This is a very thin, yet versatile laptop that offers a lot of mobility. It’s made with a sleek, all-metal construction that ensures durability, whether you take it to work, school, or on vacation. The 360-degree hinge allows for the Acer Spin 1 SP111-31-C0RZ to be used in four different modes: Tent, Traditional Laptop, Tablet, and as a Display. The vibrant 11.6-inch display is available as a touchscreen and comes with an intuitive Pen. Since there are so many different modes, this 2-in-1 device can be used for just about any kind of task. You can use the Pen to jot down ideas or take notes, watch videos and presentations, have video chats with friends and colleagues, do basic web stuff like email and research, play games from the app store, and so forth. It’s very easy to maintain a strong and consistent wireless internet signal thanks to the next-generation technology and strategic placement of the antenna. These features maximize the portability of the Spin 1. The Bluetooth 4.0 technology helps you wirelessly connect it with your other electronic devices, such as your phone, PC, certain accessories, etc. When video chatting with others, you can use the nice front webcam with 1280 x 720 resolution and built-in microphone. Stereo audio technology comes out of the two speakers. The Tent Mode allows you to chat with others or enjoy videos and movies in places where there is limited space, such as in the kitchen or on an airplane. Interfaces and ports are an important aspect of any notebook since you need to know how exactly you will be able to connect your peripherals. This Acer 2-in-1 device comes with HDMI, two USB 2.0 ports, 1 USB port, a headphone jack, and audio line out. 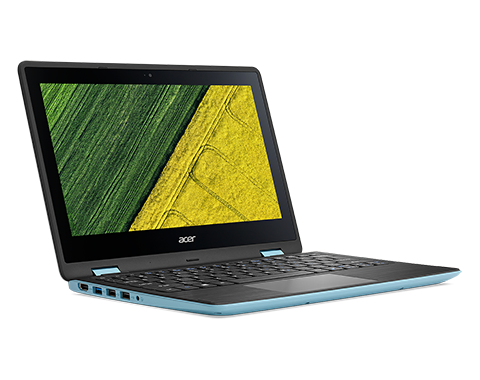 The Acer Spin 1 SP111-31-C0RZ comes available in colors such as Obsidian Black and Turquoise Blue. It weighs approximately 3.31-lbs and has a four-cell Lithium ion battery with a 3220 mAh capacity and maximum runtime of 9 hours, which is good for a notebook of this size. There is also a power supply with a 45-W maximum wattage. This is not an expensive machine. In fact, it’s highly affordable, and you can get it for even cheaper if you use Acer Spin 1 SP111-31-C0RZ ecoupons. Consumers can always expect great deals when it comes to Acer laptops and other products. Are you looking for a laptop that will wow all of your friends? While gaming notebooks usually do come with flashy looks compared to the regular, boring looking notebooks, even the gaming models are still starting to look alike. The vast majority of them come in black and red, even if there is customized LED lighting. 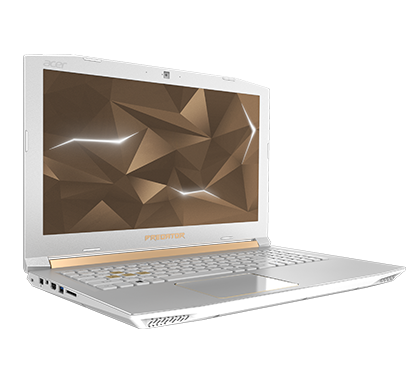 If you’re looking for something TRULY unique, then consider the new white-and-gold Acer Predator Helios 300 Special Edition PH315-51-757A. It might cost a bit more but the dazzling design and color scheme really make it worth the investment. Not only do you get the laptop itself, you get a matching white and gold mouse pad, mouse, and earphone set. The “Predator” logo is in glittering gold and located on the bezel just beneath the screen. The PredatorSense technology allows you to customize and control many aspects of the machine, like gaming features, CPU fan speed, system fan speed, and even system temperature. The dual-fan cooling system is custom-engineered and features an all metal AeroBlade 3D fan, which is capable of performing advanced aerodynamics and delivering superior airflow to keep the machine clean and cool at all times. 7 hours of battery runtime on a gaming laptop is pretty impressive. The weight of the Helios 300 SE is also pretty impressive, as it weighs around 5.95-lbs. Experience your games on the display as they were meant to be experienced. There is no motion blur to ever worry about thanks to the refresh rate going up to 144Hz. You can give the gaming sessions an extra boost with the over-clocking feature by using PredatorSense. Once again, you shouldn’t have to let the price worry you much. All it takes is an Acer Predator Helios 300 Special Edition PH315-51-757A discount or promo code and you can reduce the price at the online Acer store. This is one gaming machine that is really worth every penny. Since it’s always a leading brand in computer technology and manufacturing, shoppers can always count on getting reliable products from Acer. Promo codes are available to help everyone save. 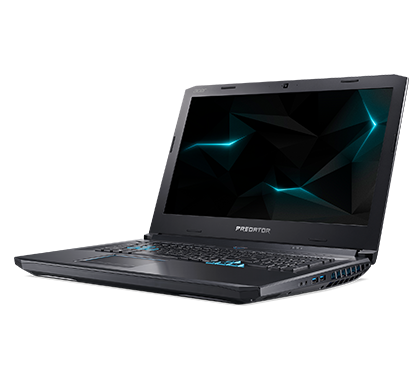 Be sure and shop online to get Acer Predator Helios 300 Special Edition PH315-51-757A deals. Acer’s goal is to help more people have access to superior technology. For this reason, the brand is continually putting out quality notebooks. If you want a 14-inch travel companion that helps you stay productive no matter where you go, one of the best options is the Acer TravelMate P4 TMP459-M-363T. While it focuses on enterprise-class features, it’s still an affordable alternative to other laptops of this class. You can expect features such as an ample selection of ports, business-centric security measures, and Wi-Fi technology. It has a nice build which consists of a matte black finish and body made of a quality plastic. The keyboard offers a firm typing experience. This machine is smudge-proof and fingerprint-proof, resulting in a clean-looking case. It’s compact enough to fit in any backpack or on any desk. Accessing the internal components and upgrading the hardware is fairly easy, as here are two maintenance panels located on the bottom. Whenever you need to communicate with associates or friends, you’ll get a full conferencing experience. There is clear, high-definition video and audio quality when using Microsoft Cortana and Skype for Business Certified. Everything is captured on the HDR webcam. In addition to the webcam, there is a microphone and fingerprint reader. As mentioned above, the connectivity / port selection is ample. There are several options, both newer and backwards-compatible. There is a Gigabit Ethernet port, which is nice to have in an office setting. For an external display, the machine includes both HDMI and VGA ports. There are numerous USB ports on the Acer TravelMate P4 TMP459-M-363T including one USB Type-C, three USB 2.0, and one USB 3.0. There is also a headphone jack and RJ-45 network. This laptop has a four-cell Lithium Ion battery with the notebook which has 3220-mAh and a maximum run time of 8 hours. The power supply offers a maximum wattage of 45-W. This is a fairly light machine at 4.63-lbs. If you’re after a budget notebook that is ideal for small business or office use, you really can’t go wrong with the Acer TravelMate P4 TMP459-M-363T. You can also use it for everyday computer and internet tasks. 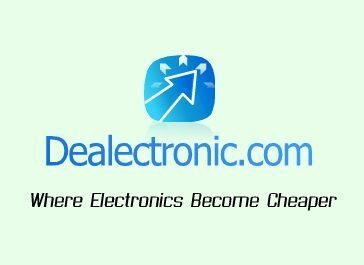 Acer promo codes are some of the best in the electronics industry. When buying a laptop like this, it’s always good to have access to online coupons. 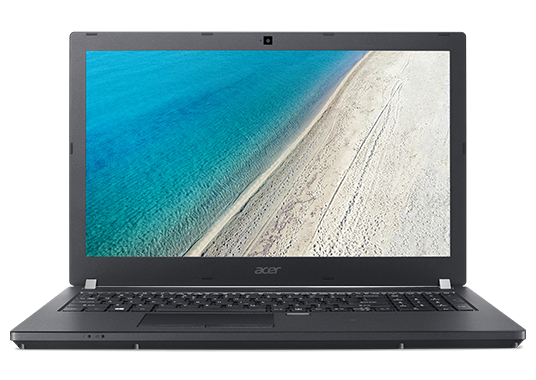 If this Acer TravelMate P4 TMP459-M-363T review has you interested in the notebook, you can start looking over discount offers right now. 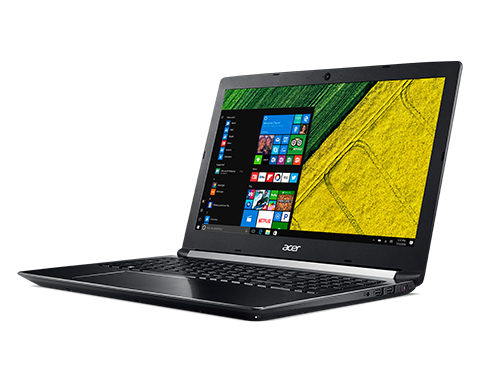 This particular model by Acer can be described as a solid multimedia notebook with a good build quality, impressive price / performance ratio, full HD display, and fast SSD storage solution. It’s an all-round device that’s available at an affordable price. 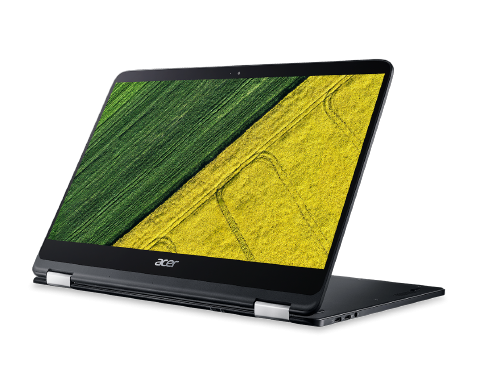 Consumers will be able to use the Acer Aspire 7 A715-71G-71L2 for a variety of tasks, including entertainment and multimedia. The case looks nice and sleek in black with a high-quality feel. The display lid and top of the base are have an aluminum finish. There is a milled edge surrounding the base, which makes the edges appear sharp. There is no flex and the hinges are nice and sturdy. The SD card reader located on the left side can easily handle common formats. While copying JPG files, for instance, users can expect at least 73 MB/s. The front webcam allows for HD audio and video recording at 720p. It has a 1280 x 720 resolution and works with the built-in microphone. There is also a fingerprint reader for security. Everything is displayed brilliantly on the 15.6-inch LCD screen, featuring LED backlight technology (1920 x 1080). There is a minimal color change only at steep corner viewing angles. For the most part, this is a display with highly stable viewing angles. With features like HDMI and multiple USB ports, it’s easy to connect the laptop to other electronics and devices. If the 15.6-inch display isn’t large enough, users can hook it up to an external compatible display. There is a Thunderbolt 3 / USB 3.1 port, 2 USB 20 ports, and 1 USB 3.0 port. The touchpad is visually highlighted by a chrome frame, which features a smooth surface measuring 4.2 x 3.1 inches. The fingerprint reader is located in the top left area, but it does not really impact the use of the trackpad. The chiclet-style keyboard has a nice design and offers a quiet typing experience. There is an optional backlight that offers white illumination. It can be turned on or off. The Acer Aspire 7 A715-71G-71L2 is a nice looking laptop with features that make it well-worth its price. 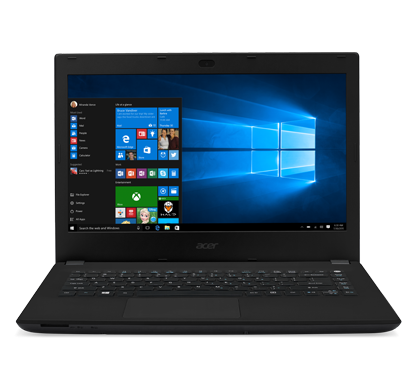 If you are concerned whether or not this laptop is worth buying, all you need to do is use a Acer Aspire 7 A715-71G-71L2 promo code and you can bring the price down even more. Good deals are almost always available thanks to Acer discounts. These days, many people are opting for a business notebook that comes with fast processors, decent graphics, wireless technology, and long battery life. The overall design is important as well. Everyone wants a light, thin laptop that can easily slide into any brief case. One good model that features everything you need is the Acer TravelMate P2 TMP248-M-76YA. The TravelMate series comes in a variety of configurations with different screen sizes. This particular model has a nice 14-inch HD 16:9 display. Its textured fabric-inspired pattern really gives the notebook a minimalist, yet appealing look and feel. The textile pattern also makes the P2 easy to pickup and hold in a firm grip. While the base is a plastic shell, it’s still reasonably solid and durable. There are beveled diamond-cut edges that help give the case a sense of depth.For connectivity, there is 802.11 a-b-g-n wi-Fi technology, Gigabit Ethernet, and Bluetooth 4.0. There are USB ports on both sides. Along the left edge there is an HDMI port, VGA connector, and RJ-45 Ethernet port. The P2 features Acer’s ControlCenter technology which gives you comprehensive manageability over crucial functions and utilities – all into a single easy-access panel. Data is kept safe the ProShield portal and Trusted Platform Module. The memory can easily be expanded to 16GB, as there is still a free slot. There is an SD memory card reader. There is an HD webcam located on the front with 720p HD video / audio recording capabilities and a 1280 x 720 resolution. It works great with the built-in microphone. Just how big is the Acer TravelMate P2 TMP248-M-76YA? How much does it weigh? Measurements in inches are 1 x 13.5 x 9.6 (HxWxD) and the weight is approximately 4.63-lbs. Another useful app is Acer Office Manager, which might appeal to you if you wish to manage multiple notebooks. It focuses on tasks such as IT asset monitoring, security policy deployment, maintenance scheduling, and so forth. The notebook is available online at an affordable price right now. The Acer TravelMate P2 TMP248-M-76YA really comes with everything a professional laptop user could need. 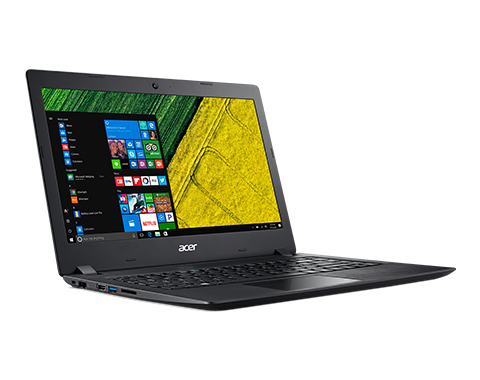 Quality business notebooks aren’t available at a low price every days, so go ahead and look over Acer laptop coupons to see what’s available right now. You really can get this model at a low price with Acer TravelMate P2 TMP248-M-76YA discounts. 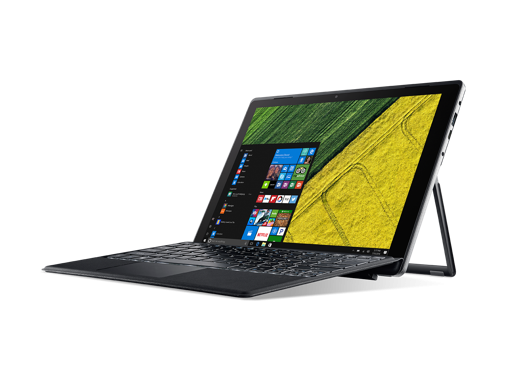 The Acer Switch 5, which is available in various configurations and at different prices, is a 2-in-1 device that rivals the 2-in-1 models offered by other brands. It’s similar to the Acer Switch 3 except that it’s bigger and more powerful. You can use it as a regular laptop or as a tablet. The screen can easily be detached and you can view everything from presentations to movies in full HD+ resolution. The rear of the case and kickstand are made out of solid aluminum. There is a “lock” which allows placing the screen at a slightly tilted position for comfortable viewing. The kickstand is foldable and can be folded out up to a 165-degree angle. When it’s not being held, the device automatically folds back to the lock position. As for the keyboard, the underside is constructed from a solid material. Its backlight can be turned on or off. Even though there is a touchscreen and stylus-support, the Acer Switch 5 also comes with a touchpad, which presents excellent gliding properties. It measures approximately 3.7 x 2.1 inches and all inputs are detected quickly and implemented accurately. Even if you’re multi-tasking, you can still expect the 2-in-1 to be cool and quiet. With LiquidLoop technology, there is a noise-free atmosphere. This technology forgoes the traditional cooling fan in favor of a “closed-loop” liquid-cooling solution that uses the physics of condensation and evaporation to efficiently dissipate heat. Another impressive feature is the battery. This two-cell li-ion battery has a 4870-mAh capacity and maximum runtime of 10.5-hours. Even when doing demanding tasks like watching movies, the battery can last for around 8 hours. It’s enough to get you through the entire workday or school day. It’s great to have when going on a long plane ride as well. The built-in devices that come with this laptop / tablet combo include a front webcam (1600 x 1200 resolution / 720p HD), rear webcam (2594 x 1944 resolution / 1080p full HD), microphone, and fingerprint reader for security. The Acer Switch 5 comes with the best wireless technology as well so that you can easily connect to a Wi-Fi spot. This little machine comes packed with everything you need for enjoying most computer and internet tasks. Order your 2-in-1 today and use an Acer coupon code, which is available just for online shoppers. There are always ways to save on a notebook when you shop with this brand. Be sure to apply the Acer Switch 5 coupon or promo code to your order.